Wonderful cottage within the city in a quiet street nestled in private garden. The accommodation comprises of large open plan living room/kitchen, 2 bedrooms, 1 with double bed and the other has 2 singles and there is a spacious shower room. There is off street parking and free on street parking. The cottage is very nice and attractive. It had all of the amenities that were promised. There was even milk in the refrigerator and the necessities to make coffee and tea. It is in a quiet, safe feeling neighborhood. It was only a short walk to the bus stop to get to the center of town. The young lady who met us at check in was courteous and helpful. There is a grocery and a pharmacy at the corner within walking distance which was convenient. The only drawback was a lack of a place to put your luggage in the small twin bedroom. We had a comfortable stay at Green Cottage. The location is great for families, and easily accessible from the city. The bedrooms are compact and light on storage, but fine for a short stay. Kitchen was well appointed, and big open plan living area is excellent. From the beginning, we were met promptly, given a tour, explained the easiest ways to visit the area, as well as locations of local groceries, pubs etc. The cottage was delightful, a great place to return to after a day of sightseeing. Very convenient location and close to bus stops to carry you wherever you wanted to go. Great self catering cottage . Off road parking . Good heating . Really a home away from home . Thoroughly enjoyed it . The cottage was adorable, but not comfortable for four adults. The website shows only the grounds, living room and kitchen. The two bedrooms are not shown and were a disappointment. Only one bedroom is suitable for two adults. The second bedroom consists of two twin beds with minimal room to walk between the beds. The mattresses are not proper for twin beds, I have had better mattresses at summer camp. We had to keep our suitcases in the living area and it was not practical to dress or get ready for the day having no space in the small bedrooms. I think the bedroom situation should be disclosed so bookings can be made without disappointment. We hebben een heel fijn weekend gehad in green gate cottage in edinburgh. Het huisje was netjes en schoon en de mensen waar het huisje van is , zijn erg vriendelijk. Edinburgh is een mooie stad en we komen zeker nog een keer terug. Lovely cottage with open plan. Every thing we needed was there.Its close to the local shops.Great friendly service when we booked. We will definitely be back and recommending it to our friends and family. Gorgeous little cottage ~pleasant enough stay during our time at the Artists' Book Market Edinburgh. Bright, open living/dining/kitchen space with all that anyone would need during a short stay. Two bedrooms ~ on the small side with limited hanging/storage facility. Small double in one room, two small singles in the other room. Somewhat dark and lacking in natural light and, due to heavy rainfall during the night, very noisy on the dormer windows. Some nice touches ~ wood burning stove, fresh fruit and cake on arrival, and a small library of good books. Somewhat overpriced ~ in keeping with "rugby weekends". About 15 minutes drive from Princes Street. Good free parking facility on-site. Beautiful garden and seating area. Good size bathroom although water for the shower was just warm, and some shelves/soap trays would be helpful. Just returned from staying at Green Cottage in Edinburgh through Greatbase. This is a fantastic cottage with a garden in the Trinity area which is not too far from the Botanical Gardens. Not in the center of town but the bus no 23 goes directly there and is very convenient. This was our fourth stay here and we will definitely return. There are so many extras provided by the owner, even a Christmas tree! The sitting/dining/kitchen area is extremely big and there is a wonderful log burner. The only downside is maybe the size of the two bedrooms, but then again they are only to sleep in. Would recommend this Cottage to anyone. Overall, this cottage was a pleasure to stay in. It was warm, welcoming, and spotlessly clean. The kitchen was very well equipped. It was a special bonus to find that the cottage and immediate surroundings were so quiet, just what's needed for a relaxing evening after a day in the city. We especially appreciated the fact that there was a generous amount of wood for the wood burning stove. Our only negative comment is that the second bedroom (next to the bathroom) is far too small for two beds. There was nowhere to store clothes, and almost no room to move, once through the door. It would be a big improvement to make this a single room with a chest of drawers. 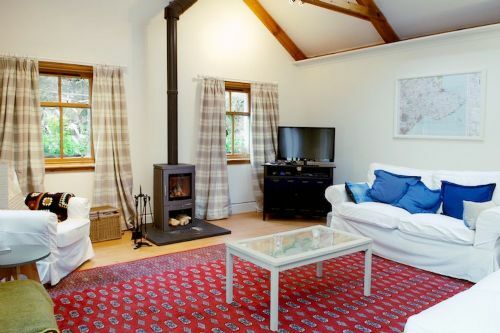 Green Cottage is a spacious bolt hole in the middle of Edinburgh. Ideally placed for the Botanic Gardens and a short bus journey from the centre of town. The property has off road parking and there is a large supermarket within 1-2 miles. Facilities in the cottage are excellent. Dishwasher, washing machine, microwave as well as a the usual cooker, fridge and kettle. WiFi, TV etc make this a perfect location for 4-6 people. Highly recommended. We loved Green Cottage so much when we stayed here before that we didn't even consider staying anywhere else on our next visit to Edinburgh. The personal touches such as the table set for tea on arrival and complimentary tin of shortbread were much appreciated at the end of a long journey. This was a real quiet retreat in the suburbs of Edinburgh. Walking distance to some great pubs and a short walk to the bus into town. Everything was provided , including board games, and great internet. Thoroughly recommend. We chose this cottage on the outskirts of the city, rather than an apartment during the busy Festival/Fringe period in August. Fringe/Festival causes the rental price seems to double then. Hence value for money rating just OK. There are 3 buses which stop nearby which take you conveniently to city centre locations. Local information, maps and guides, which were provided, proved most useful. The cottage was cosy, well furnished and comfortable. Peaceful and safe location after the buzz and noise of the city by day. A lovely place to stay, and a nice 15 minute walk to Granton shore to stretch your legs. Welcoming and comfortable, a cottage like feel in the city. Very quiet and a short bus ride or longish walk to the city. Small bedrooms but plenty of living space. Well equipped kitchen with good appliances. Imagine it would be cosy in winter. Outdoor space a bonus -dinner in the garden was very pleasant. Nice place. On the map it seems far away from the centre, but in reality it isn't. Good bus services to town, not far from Botanical Gardens and Stockbridge. Very quiet, homely. Lovely touch to be welcomed with a cake. This must be nice in summer when you can use the garden! Absolutely fantastic location for us to visit family locally. Amazing extras including a beautiful Christmas tree, mince pies, sparkling wine ... The cottage was like a home from home and the log burner was a luxury. Easy parking on the street made it very attractive to us. Lovely big walk in shower room and lots of fluffy towels. The bedrooms are slightly on the small side but the very large sitting room/kitchen makes up for that. A very comfortable holiday cottage which we hope to return to! A very pleasant way to enjoy Edinburgh, well located in a quiet area not far from the centre. Perfect for a family, really a great experience that we'll soon repeat.Thank you! We had a perfect stay in the cottage. From the warm welcome to the comfortable accomodation - it was just what we needed. The cottage offers family's an Oasis from the hustle and bustle of Edinburgh city centre a short taxi/bus away. We are already planing our return. From the moment we entered Green Gate Cottage it felt like you had stepped into an Oasis of peace and tranquility, what an haven set in the beautiful and interesting City of Edinburgh. As soon as we entered the cottage we felt the burdens of the mundane of life had lifted. Slept better than at home, we all commented on the comfortable beds, a touch of home comforts along with luxury. Shower fantastic, log burner so homely none of us wanted to go anywhere else. Loved the outlay of the Cottage, toddler came with us and enjoyed the spacious freedom of the Cottage plus was safe in the garden for children with a locked gate. We all did not want to leave and wish we could have had longer. Parking facilities was a big bonus, the city centre access was only about 15 minutes in the car. What a fantastic place to spend with family. Thank you to the owner for the gorgeous banana cake which we all enjoyed. It was a very memorable and special trip thanks to Green Gate Cottage. Beautiful cottage in a very convenient location for us to visit family and the city. We are looking forward to our next visit over Christmas! The use of the little garden would be lovely in the summer. Green Cottage is in an excellent location for using the super bus service into Edinburgh. It's a unique cottage which has luxurious fixtures and fittings. We loved the abundance of Harris tweed cushions! The open plan living area is lovely and large. The owner, who lives next door called to offer us anything that we might need at any time during our stay. We would have loved a bath, but managed without one and had a wonderful week in Edinburgh and can't wait to come back. We cant fault Green Cottage at all. It felt like home as soon as we walked in. It was the perfect place to come home to late every night after our 6 busy days at the Edinburgh Festival Fringe. The location outside the busy city centre was just right for us as it was quiet enough to sleep, but the bus stop just outside and the good bus service meant it was as easy as possible to get right into the action in Edinburgh again each day. The cottage was clean, and the living room/kitchen was lovely and spacious. The cottage, location and amenities were excellent and we had a lovely weeks holiday. - no key for the garden gate so had to leave it open when out. - double gates appear to be electric and no way of opening to get cars in? - garden and path in need of cutting back/tidying/sweeping. Greengate is a haven within a city! My family and I had a wonderful stay yet again in Greengate. All the wee special touches make it very special indeed! Edinburgh has so much to offer but it's very hard to steal yourself away from the refreshing atmosphere, the comfort and glow from the wood burner in Greengate. Already planning our next trip. The best equipped cottage I have stayed in. Stayed over Christmas and was greeted by pretty decorated tree, candles and table decoration. Green cottage was a great choice for our weekend in Edinburgh. The standard of everything in the cottage is very high - central heating, hot water, kitchen, bathroom, beds, linen, decor - all quality, new fixtures. When you arrive there is whiskey, milk, shortbread, tea, coffee and other bits and pieces so you don't have to rush out for essentials.